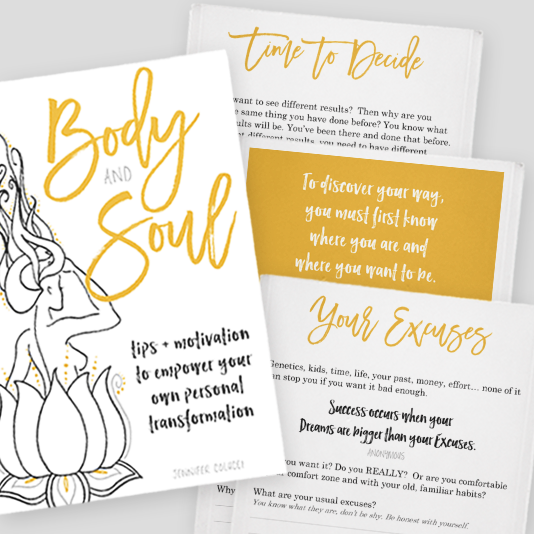 The Body & Soul book has arrived! It’s a big, scary and exciting moment for me — my book is available for sale! Not the first one I’ve ever started, but its the first one I’ve ever finished. After years of dabbling in writing — starting with fan fiction in junior high, fiction in high school, blogging for business — I have finally written and published my first book! I never would have thought my first book would be about weight loss. I have been overweight my enter adult life. If you told me I would be an inspiration to others for weight loss, i would have laughed and sarcastically responded, “Yeah, right.” Say the same thing to me now and I will proudly and excitedly say, “Yeah, I AM!” I am proof that you can change your life, get healthy, look fantastic and feel amazing! You have to change your mindset before you even tackle changing your nutrition or activity. If you are like me, you’ve tried a lot of different diets, fads, boot camps, cleanses, etc. Despite some progress, its always been too difficult for you and your lifestyle. So you fall into a vicious cycle of cheating and beating yourself up because you did. Or you reward your ‘good’ behavior with a treat. Or maybe you are an all or nothing kinda dieter and end up quitting or worse never starting, thinking if you can’t be perfect, why do it? I spent so long concentrating on the outcome, how much weight I had to lose, that I lost sight of the journey. Depriving yourself of a slice of birthday cake helps your waistline today but can create a memory of resentment later for you. That your overweight body, yet again, forced you not to have fun like everyone else. To feel bad, embarrassed, ashamed about yourself again. Instead, choose to have a half slice and you won’t beat yourself up. You get to experience life and still make a healthier choice then you used to. And you will feel better. Why? Not because you rewarded yourself with delicious food, but because YOU made the choice. You didn’t let the most recent fad diet dictate how you can live, you made a conscious choice and won’t feel resentment. When you concentrate on the journey, you live in the now, focusing on the step you are taking NOW, instead of anxiously worrying about your future or regretting your past. It’s time to decide to make better choices. If you make a better choice today than you did yesterday, then your tomorrows will be better than your todays. So, what will you choose to do differently today?